Sculpture: "Few Knew My Secret"
SOLD. 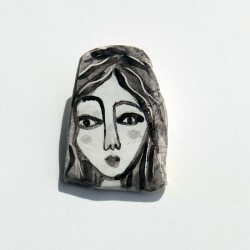 Porcelain Pin: "Woman with Black Hair"
One-of-a-kind handcrafted porcelain pin created by Charles Kaufman.Only one available - one of a kind. 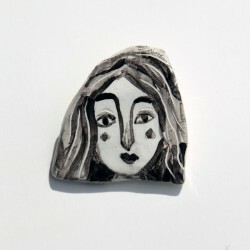 Initials & date on the back.Hand sculpted, painted and kiln fired glazed clay ceramic. 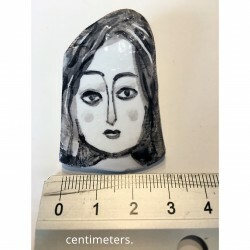 Size: Approximately 3 x 4 cm / 1.2 x 1.6 inches.We ship worldwide. Shipping costs here. 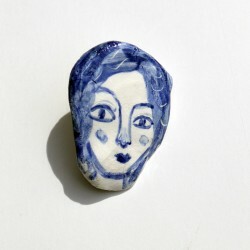 Porcelain Pin: "Woman with Black Hair-2"
Porcelain Pin: "Woman with Black Hair-3"
Porcelain Pin: "Woman with Blue Hair-1"